GURPS High-Tech: Adventure Guns is a 48-page supplement describing the firearms and some other "high-tech" (TL5-6) weapons used from the second half of the 19th century until WWI, the period of the great adventurers and explorers in the Wild West, In Darkest Africa, in Transylvania, along the Indian Northwest Frontier, or 20,000 Miles under the Sea. However, it also details which guns were used at home -- by the police in New York, Berlin, or London; by the Texas Rangers; by the armies in the American Civil War, the Franco-Prussian War, the Spanish-American War, the Boer Wars, and the Boxer Rise; and by ordinary gentlemen, outlaws, or hunters all over the world. The guns featured are intended for outfitting American gunslingers, Indians, and homesteaders in the Wild West; for British Victorian detectives, hunters, explorers, and soldiers; for Prussian officers and German archaeologists; and for ordinary people of that time and age. 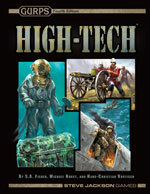 In addition to being well-suited as a companion to cliffhangers, horror, GURPS Lands Out of Time, and GURPS Mysteries games, this supplement is especially designed for Old West or steampunk campaigns, particularly those who want to upgrade those genres' GURPS Third Edition firearms to Fourth Edition terms. Reviewers must be registered e23 customers who have spent more than $50 at e23 in the past 12 months. We expect you to know the GURPS Basic Set and GURPS High-Tech well! Familiarity with GURPS Gun Fu and/or GURPS Tactical Shooting is an advantage, as is an understanding of the GURPS Third Edition supplements GURPS Old West and GURPS Steampunk. This is not intended to be a large playtest. We're looking primarily for playtesters who have experience with real guns or are deeply knowledgeable about historic firearms (as the final supplement will be similar to GURPS High-Tech: Pulp Guns 1 and GURPS High-Tech: Pulp Guns 2). Seasoned playtesters who have limited practical gun knowledge but are well-versed in their treatment by the game and are experts on relevant historical or fictional backgrounds -- such as the steampunk genre, Old West adventures, or authors like Arthur Conan Doyle, H.G. Wells, or Jules Verne -- can also apply. The playtest is currently scheduled to run from May 7, 2012 to May 28, 2012. Prospective playtesters should e-mail greytiger@gmx.net with [AG] (for "Adventure Guns") in the subject. Include your preferred e-mail address for the closed playtest mailing list, correct spelling of your name as it may appear in print, your e23 login name, and a few words on why we should pick you: qualifications, experience, current gaming group(s), etc. Information about the preferred submission format is in the forums post for this playtest call.